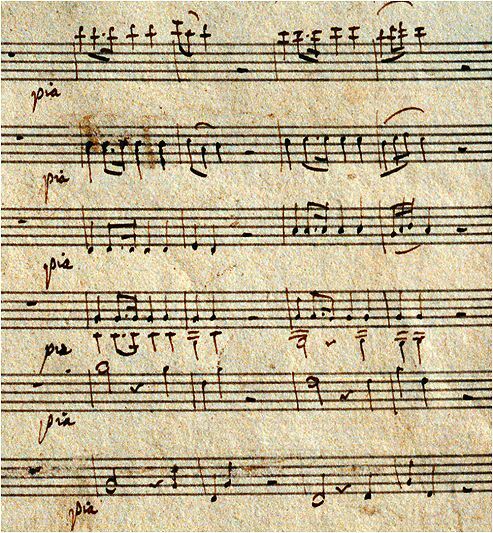 The following paper was presented on 12 February 2006 at the conference "Mozart's Choral Music: Composition, Contexts, Performance" at Indiana University in Bloomington. While attending this conference I was denounced as "self-appointed Mozart expert" in an Austrian newspaper by an ORF journalist, because I had publicly protested against the criminal and completely pointless opening of Constanze Mozart's grave in Salzburg for the only reason of making money with a worthless TV documentary. 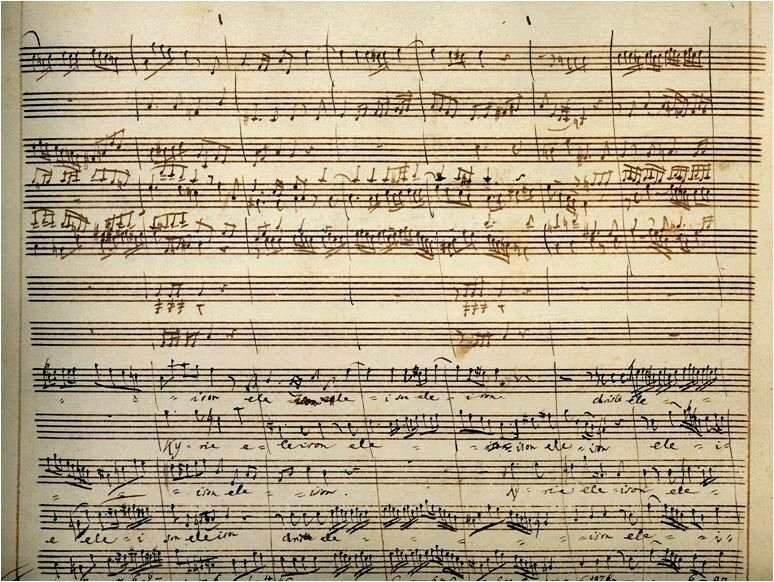 Mozart’s Requiem K. 626 represents an unique case of an unfinished masterpiece that has been the object of not only astonishment and admiration, but also confusion and heated discussion. 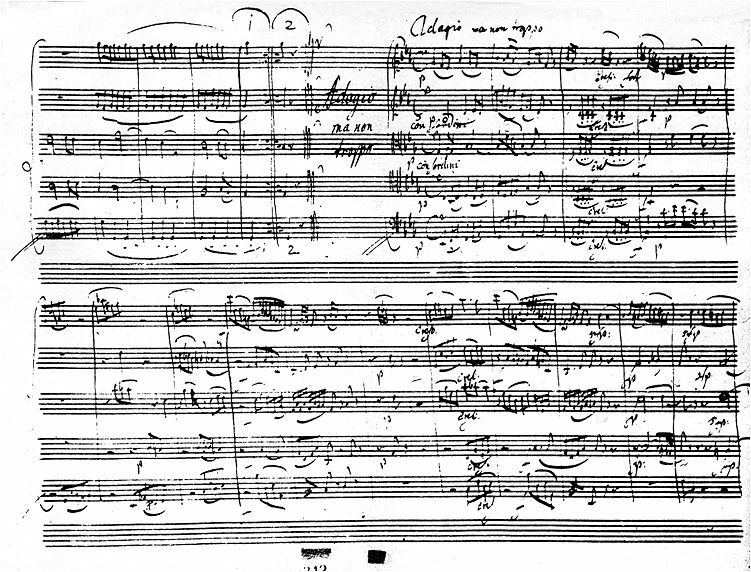 After the dispute at the beginning of the 19th century about the authenticity of the musical text had long calmed down and the focus of scholarly interest had shifted to other issues, such as the genesis and the dating of the work, it soon became obvious, that Mozart's and Süßmayr's hands were not the only ones to be found in the original manuscript of the Requiem. At the 1973 conference of the Zentralinstitut für Mozartforschung Leopold Nowak, who had edited the Requiem for the NMA, presented his idea that the orchestra parts of the Kyrie – with the exception of trumpet and tympani parts – were written by Mozart's pupil Franz Jacob Freystädtler, a hypothesis that in the following three decades was broadly accepted by Mozart scholarship. 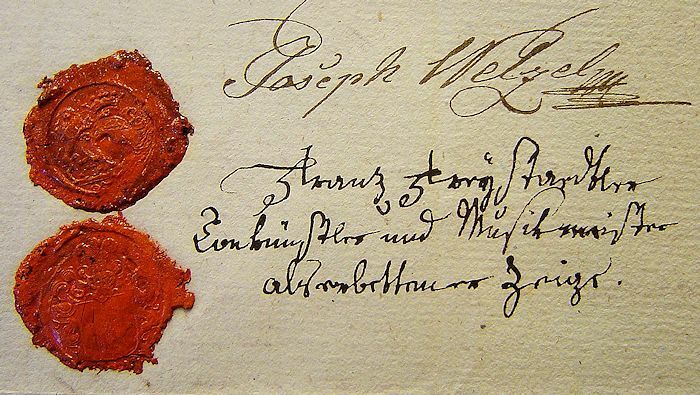 After all, who was supposed to doubt the judgement of a renowned musicologist who, as former head of the musical collection of the Austrian National Library, had had the autograph of Mozart's Requiem lying on his own desk? I intend to challenge the correctness of Nowak's identification, because I think it is entirely based on faulty methodology and a limited consideration of the sources. Nowak's hypothesis was caused by his obvious refusal to accept an anonymous hand in the most prominent score of his own collection. I cannot offer a new identification of the handwriting in question and shall therefore come up with more questions than answers. Like most scholarship, my own working theory will only represent another model of thought which I hope may someday become out-dated. To divert your attention from this deficiency I will present lots of pictures of Freystädtler's musical handwriting and other relevant documents. Let me go back to December 1791. On the last night of Mozart's life, as Franz Xaver Süßmayr sat down in the orchestra pit of the Burgtheater to substitute in a performance of Paisiello's La Molinara, the torso of Mozart's last composition consisted of the following: forty-six leaves, or ninety-two pages, eighty of which contained what music Mozart had managed to set down in draft. 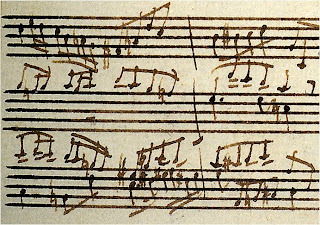 Only the forty-eight bars of the opening Introït had been fully scored, and the rest was written out in particello, with the voice parts and instrumental bass complete, and the occasional detail in the other orchestral parts to indicate the general form of how these were to be completed. 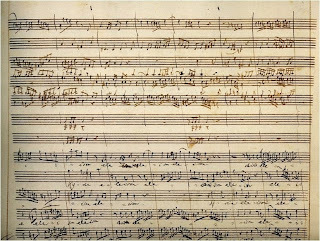 Mozart had left the Lacrymosa as an unfinished eight bar fragment, and no music had been written to follow the Offertorium; it is plausible that in his mind Mozart had already drafted the overall plan of the music, but death kept him from writing it down, except in fragmentary sketches. 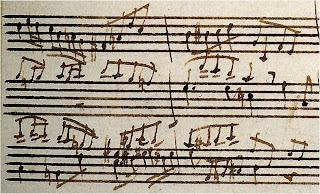 The beginning of the Kyrie of Mozart's Requiem. A-Wn, Mus. Hs. 17561a, (K. 626) folio 5v. 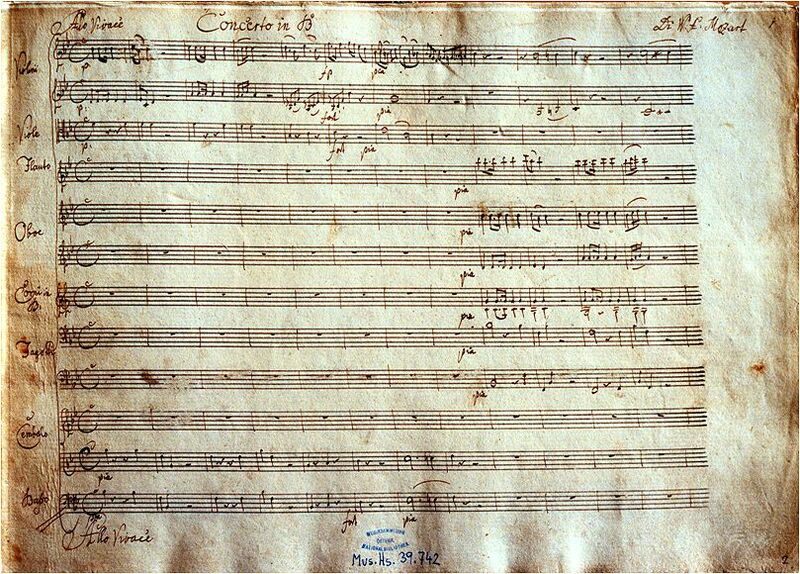 Although the handwriting of the orchestral voices in the Kyrie differs irritatingly from Mozart's own hand in the choral parts, the authenticity of the instrumental voices had never been doubted until Nowak's edition of K. 626 for the NMA. 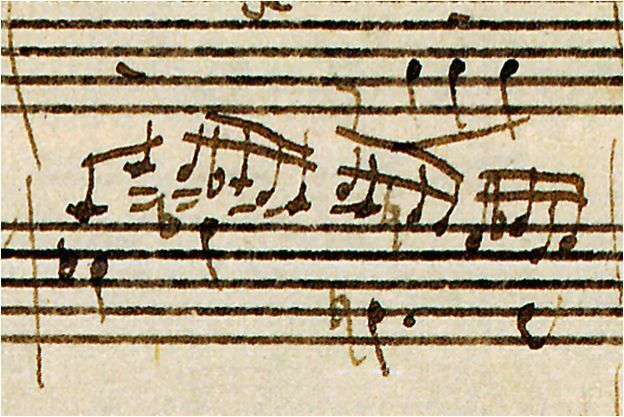 In the preface of this edition Nowak writes: "The difference of the handwriting in the Kyrie-fugue poses a mystery that can hardly be solved in a satisfying way. 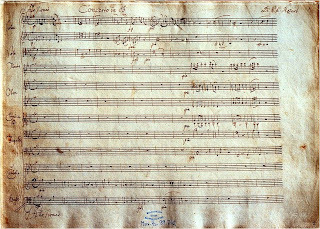 Compared to Mozart’s normal writing in the chorus parts and the instrumental bass the remaining parts of these pages, folio 5v until 9r somehow look 'sick'." Nowak continues: "One is tempted to say that these are Mozart's final notes and not the Lacrymosa. 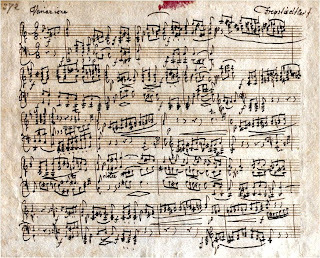 It is however perfectly possible that Mozart wrote the instrumentation of the fugue which to him was a mechanical work, during an attack of sickness, when he felt unable to continue composing". Nowak especially referred to passages like the above in the woodwind parts on folio six of the Introït. The disorder of this notation, with rarely a parallel stem and differing stroke lengths, bears a striking dissimilarity not only to Mozart's musical hand, but to most handwritings of professional music scribes of the late 18th century. Even more doubt was cast on the authenticity of this orchestration when Franz Beyer pointed out in the preface of his 1971 edition of the Requiem that something else is amiss in the orchestration of the Kyrie fugue. Beyer had made a discovery which (as Paul Moseley put it) "was remarkable principally for its tardiness": in the basset horn parts flat and natural signs are used consistently in front of each written high f'' (sounding as b' flat), instead of naturals and sharps respectively. A mistake that Mozart would never have made. Furthermore a few passages that are uncharacteristic of Mozart, such as consecutive octaves, caused Beyer to attribute the orchestration work in the Kyrie (which all in all consists of little more than just distributing and copying the chorus parts) to Süßmayr. In 1973, Leopold Nowak examined the autograph again, only to realize that the orchestra parts in the fugue were actually written by a third hand that still had to be identified. As I mentioned already, Nowak understandably harbored a special affection for Codex 17.561 of his own collection. He seems to have had that kind of relation to other manuscripts as well, manuscripts that only were of musicological concern to him. Any musicologist who wanted to examine a Bruckner autograph in Austria during the 1970s, regardless of its location, had better ask in advance for a permission from Nowak who at that time was regarded to be the most eminent Bruckner scholar alive. Nowak obviously found it very difficult to accept that some anonymous scrawler had left traces in the Requiem autograph and thus he set out to identify the unknown scribe at all costs. The methods he used for this identification, however, were a little odd to say the least, and I dare to note that research on eighteenth-century composers of church music was definitely not Nowak's forte. He randomly drew up the following list of possible candidates: Albrechtsberger, Eybler, Freystädtler, Neukomm, Preindl, Roser, Seyfried, Süßmayr, and the two Teybers, Anton and Franz. A few of these names strike us as totally out of place: by the time of Mozart's death, Freystädtler had not composed a single piece of church music, Sigismund Neukomm was a thirteen-vear-old (!) student in Salzburg and Johann Roser was living in Linz. In 1791 Franz Teyber was employed in Cologne and his brother Anton had returned from Dresden by the end of that year to become adjunct kapellmeister at the Burgtheater. 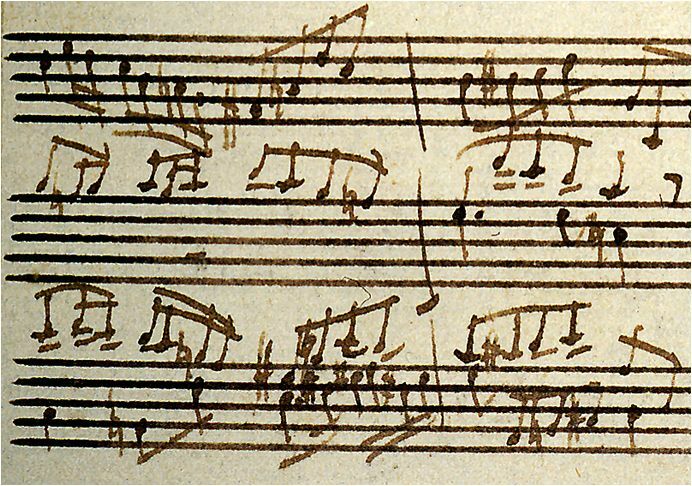 After having checked and dismissed the handwriting of nine of these composers (who had been highly unsuitable candidates to begin with), Nowak attributed the mysterious third hand in the autograph of the Requiem to Mozart's pupil Franz Jakob Freystädtler. His self-assured line of argument went as follows: "Because there are no clefs, the fugue follows right after the Introït, and because the notes as such offer only limited and unreliable clues, we only have the accidentals and – curious as it may sound – the character of the whole-bar rests." Nowak based his identification on the shape of the natural signs whose right hand stroke ends with a hook at the bottom. Mozart's natural signs are written with just three more or less straight pen-strokes of which the last one is only slightly curved and almost vertical. 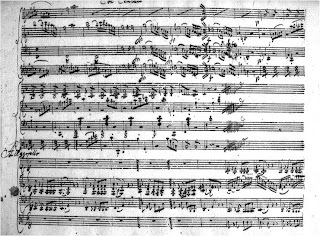 1) Freystädtler's arrangement of Mozart's string quartet K. 590 for violin, viola and piano, written in 1792 (erroneously dated to 1790 by Nowak), of which a part is held today by the archive of the Gesellschaft der Musikfreunde. (The larger part of this manuscript is in the Staatsbibliothek Berlin). 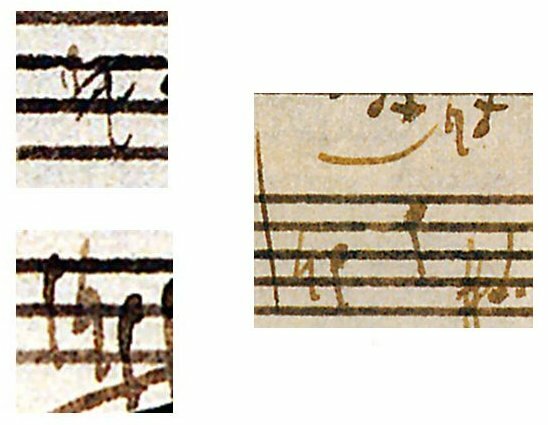 It is significant that the three naturals on the above picture are the only ones from a Freystädtler manuscript of Mozart's time which Nowak presented in support of his identification. 2) Freystädtler's variation of Anton Diabelli's waltz for the "Vaterländischer Künstlerverein", written around 1820. Folio 1r of Freystädtler's Diabelli-Variation (ca. 1820). A-Wn, Mus. Hs. 18.372. 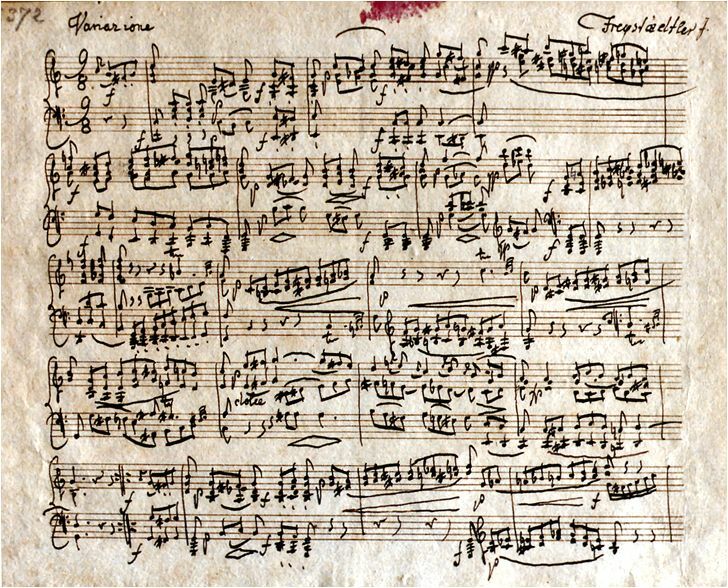 3) A copy of Mozart's piano concerto in B flat major, K. 456, which Freystädtler made around 1787. It had once belonged to Franz Hauser and was subsequently sold to Dr. Carl Bär who provided Nowak with photocopies of the manuscript. Today it is held by the music collection of the Austrian National Library. For reasons which will soon become obvious, Nowak did not use photocopies of this source to support his theory, but only referred to it in two footnotes. I shall return to this manuscript later. I am not the first to have noticed the flaws in Nowak's identification. In his book on his edition of the Requiem, published in 1988, Richard Maunder already doubted Nowak's Freystädtler hypothesis: "Neither Mozart nor Süßmayr is quite so consistent in the writing of natural signs as Nowak suggests, for the facsimiles in the Neue Mozart Ausgabe edition of the Requiem show that both of them occasionally used Freystädtler's form of naturals signs […]. 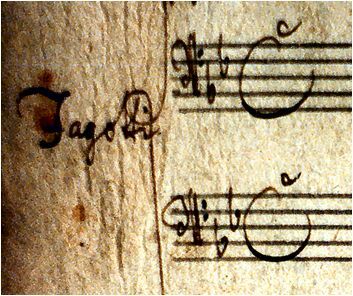 Even if it is accepted that the handwriting is unlikely to be Mozart's, it is surely too much to identify Freystädtler with confidence merely from the shape of the natural signs." One year after Maunder, Paul Moseley even went further in his negative evaluation of Nowak's identification: "Nowak tried to show that the string and woodwind parts are in a third hand, that of Jacob [sic] Freystädtler, on account of the shape of the natural signs. The evidence for this is less than conclusive: Nowak weakens his case by showing that the hooked natural is a feature of other Viennese composers. Furthermore the 'hook' is often no more than thickening, and Mozart himself sometimes wrote naturals in this way." It is correct that many of Freystädtler's natural signs bear a lower right hand hook. But, to strengthen his argument, Nowak deliberately picked only hooked naturals from Freystädtler's manuscripts to use them as examples. 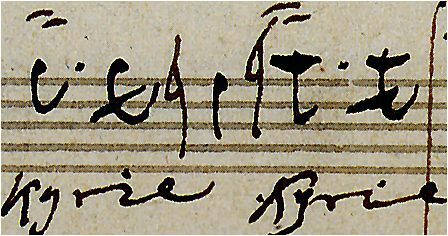 Freystädtler's autographs also contain many naturals without a hook. Based on a similar kind of flawed logic, one could declare that Mozart himself orchestrated the Kyrie, because he also wrote hooked naturals. 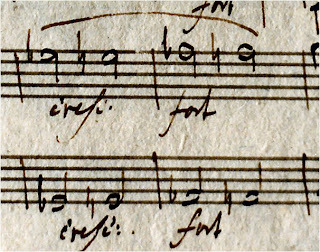 Nowak had to disregard the musical notation and narrow his focus down on the hooked natural signs, because there is absolutely no other distinctive feature that Freystädtler's handwriting has in common with the anonymous hand in the Kyrie fugue. Nowak's point that "the notes as such offer only limited and unreliable clues" was the only way for him to dodge all the unwelcome discrepancies between the two hands he wanted to present as being identical. 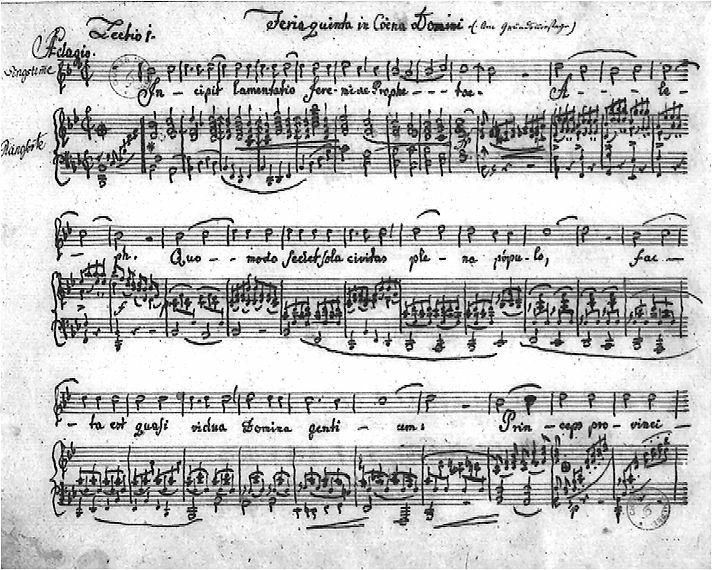 By disregarding other available samples of Freystädtler's handwriting and once again presenting this relatively unknown composer as a rather inexperienced amateur, Nowak reduced Freystädtler to a kind of musical scapegoat, a role not unlike Süßmayr's, who like Freystädtler has repeatedly been described as "Mozart’s Hausnarr" (Mozart's home fool). Nowak was not the last musicologist who thought he could spare himself the research on a so-called Viennese "Kleinmeister". A hook on the last stroke of a natural sign is only produced when the quill catches the paper, as it is drawn away from the surface. Since this catching process mainly depends on pure physical conditions, such as the sharpness of the quill, the amount and liquidity of the ink and the roughness of the paper, the development of a hook at the end of a natural sign involves too many coincidental factors. Therefore these hooks are absolutely unsuitable to serve as basis for a reliable identification of a scribe. 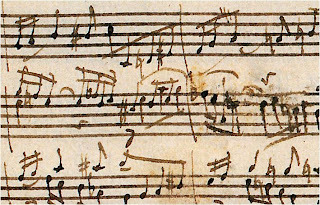 The immanent variety of hooked and hookless naturals in a single manuscript, caused by the above factors of coincidence, can easily be observed in Mozart's and Freystädtler's autographs. Freystädtler's hookless and hooked natural within a single bar. A-Sm, Ms. Freystädtler (Freystädtler-Studien), folio 2r. 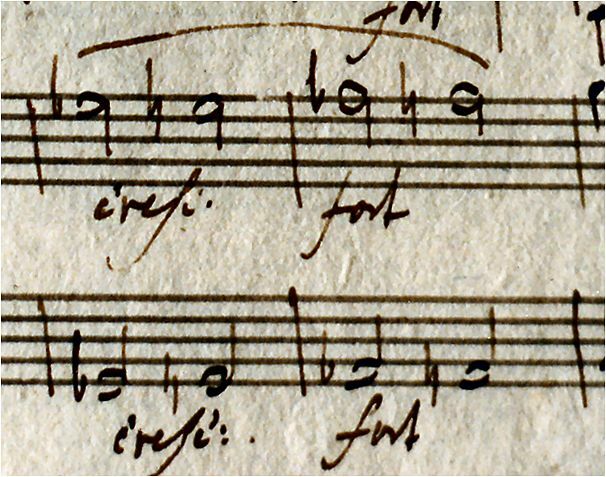 This variety can also be observed in the handwriting of the anonymous scribe of the instrumental parts in the Kyrie. Because of this coincidental factor we cannot base the identification of a hand on the hooks of naturals signs. In an effort of reckless wit, we could even say that the shape of the accidentals is much too accidental. 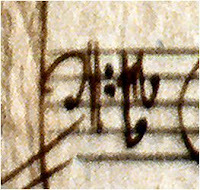 Why Nowak paid no attention to features of the musical notation proper, becomes very obvious when we look at the most beautiful and most important of Freystädtler's surviving manuscripts: the copy of Mozart's piano concerto K. 456, which is not listed in the NMA's online database of Mozart copies, and according to its last private owner Friedrich Georg Zeileis bears autograph corrections by Mozart. 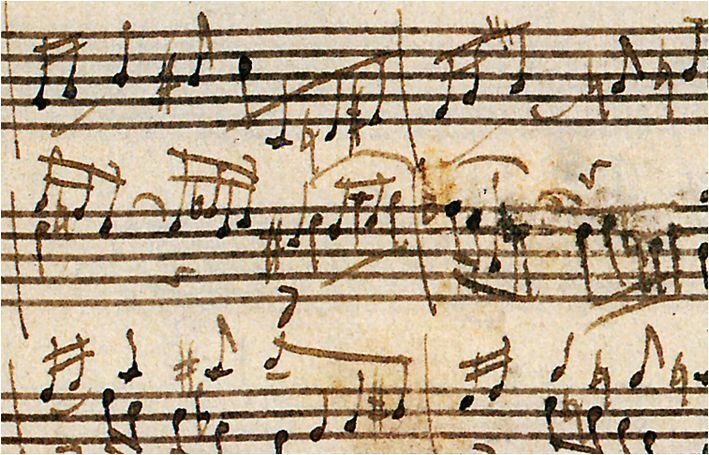 But in my opinion the only autograph entries by Mozart in this document are the foliation numbers in the upper right corners of the paper. Folio 1r of Freystädtler's copy of K. 456. A-Wn, Mus. Hs. 39.742. The neatness and orderliness of this manuscript forms a striking contrast to the chaotic handwriting of the anonymous scribe in the Requiem and is by far the most convincing evidence that the scrawled notes in the Kyrie fugue should no longer be attributed to Freystädtler. Most of the natural signs in the copy of the piano concerto K. 456 bear no hook. This irritating fact was also noticed by Leopold Nowak who preferred to push aside this unwelcome evidence by claiming that "Freystädtler began writing hooked natural signs only during his stay in Vienna". Nowak failed to check the natural signs in the "Freystädtler-Studien" in the library of the Stiftung Mozarteum which prove the opposite. We recognize the very same wishful thinking in Nowak's statements that there "are no clefs in the fugue" and "we only have the accidentals". Both statements are false. There is a bass clef in the bassoon part at the beginning of the Kyrie fugue which Nowak completely ignored. 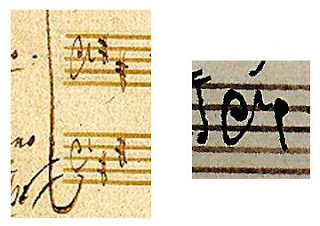 Neither was the bass clef in the Kyrie written by Mozart who rarely wrote two dots after the clef, but only suggested them by drawing the lower curve of the clef up to the f-line. 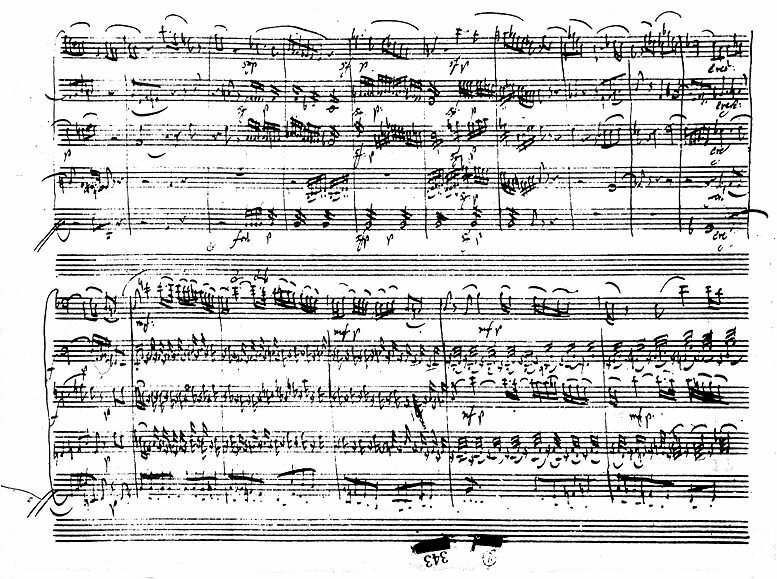 The other significant feature in the Kyrie, which Nowak chose to ignore completely, are the three "Adagio" entries at the end of the fugue above bar 50 of the basset horn and string parts. 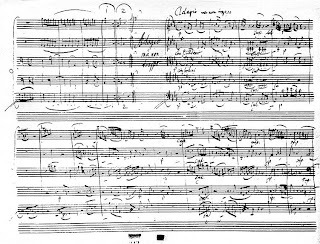 The uppermost "Adagio" seems to have been written by Süßmayr in his well known "assimilated Mozart" style after the orchestration was finished. But the other two in a different Latin script represent quite a puzzle. Mysterious as their origin and chronology are, they certainly do not originate from Freystädtler. 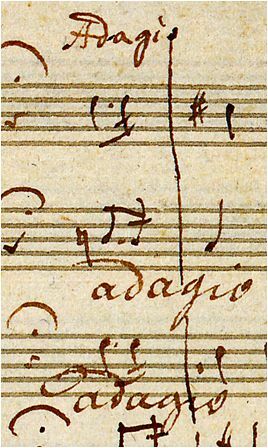 Since his Viennese autograph scores contain no movement in Adagio tempo, locating a sample of Freystädtler's Adagio marks, proves difficult. Because the entry in his "Lamentations of Jeremiah" is much too decorative, Freystädtler's most typical Adagio mark is the one on the two leaves that he copied to substitute two missing leaves in the autograph of Mozart’s string quintet K. 516. 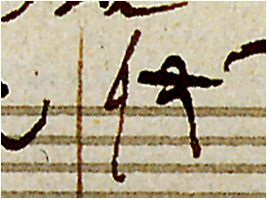 The identification of Freystädtler's handwriting in Mozart's manuscript of K. 516 can be found in the NMA's critical report of the edition of the string quintets and in the foreword of a new Bärenreiter pocket score (both written by Manfred Hermann Schmid). What cannot be found there, is the information that I already published this fact in my article "Franz Jakob Freystädtler. Neue Forschungsergebnisse zu seiner Biographie und seinen Spuren im Werk Mozarts", in Acta Mozartiana 44, vol. 3-4 (1997), several years earlier than Schmid. 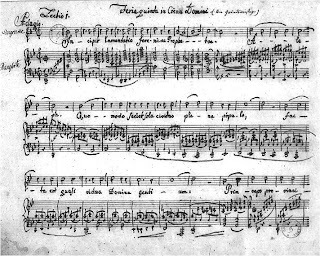 Freystädtler's Adagio entry on fol. 9 of K. 516. PL-Kj, Mus. ms. autogr. 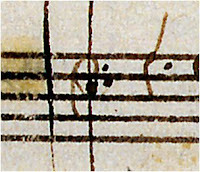 Mozart 516, fol. 9r. 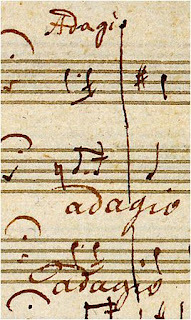 As can be seen, Freystädtler's Adagio mark at the beginning of the third movement of K. 516 does not match the Adagios in bar 50 of the Kyrie. Leopold Nowak's disregard of all these important details throve on a more general ignorance of Freystädtler's biography and personality. If Nowak had known more about this composer, the idea of attributing the orchestration of the Kyrie might never have entered his mind. 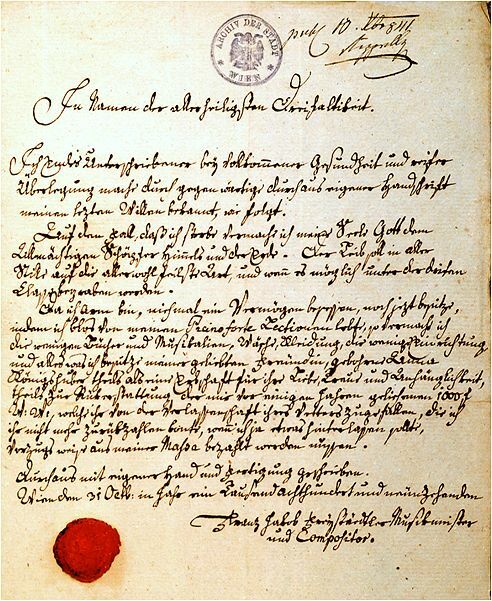 I have spent years doing research on the guy whom Mozart gave the nickname "Gaulimauli", and although I have come to know a lot about Freystädtler, like the colour of his eyes or who the godfather of his illegitimate son Sigmund Franz Königshuber was, I only want to give a very short summary of his life. At the very beginning, I want to point out that Freystädtler had one thing in common with Süßmayr which has generally been neglected by Mozart scholarship: both of them enjoyed a first rate education at a school in a Benedictine abbey. The highly specialized training that both of them received can be noticed in their handwriting, their grammar and spelling (which is by far superior to Mozart's), and their excellent musical abilities. Especially Freystädtler has always been cast into the light of having been a musical beginner, a kind of "second Süßmayr", only less accomplished. This was partly caused by the fact that the wrong year of his birth, namely 1768 (as published by Alfred Orel in the old MGG), has been repeated frequently in the literature, not only in the NMA's edition of Freystädtler's studies, but also in various music encyclopedias as recently as 2005. Freystädtler was born in Salzburg on 13 September 1761. The entry concerning the baptism of Franz Jacob Freystädtler on 13 September 1761. Salzburg, St. Andrä, Tom. 3, p. 293. Freystädtler was obviously born in a house on the Linzer Gasse. Bona quidem mente praeditus, sed eo deterior in moribus, in religione, in amore, in debitis in otio. He is just as gifted with an excellent intellect, as he is bad in morals, religion, love affairs, an inclination for contracting debts and being lazy. At the age of sixteen, after having been chosen from among thirty-three competitors, he was appointed organist at St. Peter's, where he served until 12 September 1782. He definitely did not take part in the first performance of Mozart's c minor mass, as has frequently been suggested by various authors. A list of the musicians of St. Peter's shows that he also was a bass singer and played the cello. Martin Bischofreiter's Status Musicorum St. Petri Secundum Nomina 1780 et 1781, giving "Basso. Violoncello" as Freystädtler's additional skills. 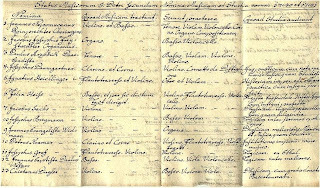 A-Sl (displaced document in the records of the Salzburg municipal court). By 1791, Freystädtler was an accomplished musician, improviser, composer and music teacher. 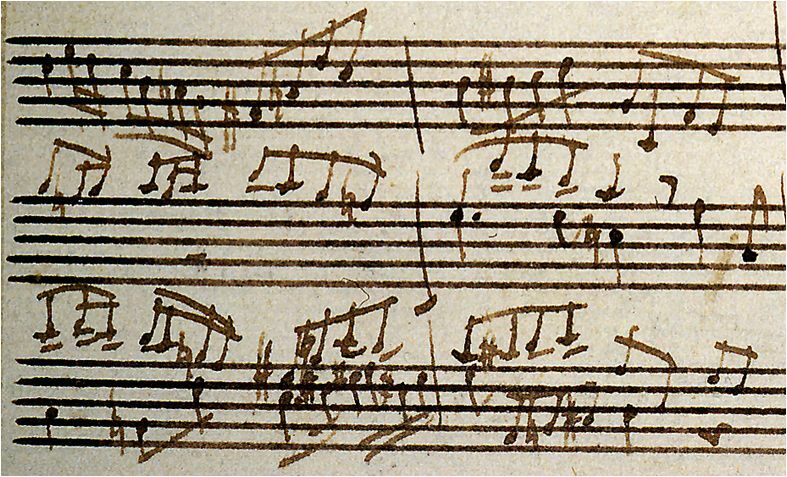 To shed light on his superior education and to demonstrate how the attribution of the clumsy copywork in the Kyrie amounts to a gross miscalculation of his skills, I will show a few samples of his typical baroque Salzburg style handwriting. 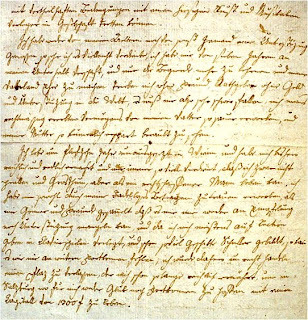 Freystädtler's letter of 12 September 1801 to the Salzburg municipal court. A-Sl, Stadtgericht 1480. Freystädtler's autograph will written on 31 October 1819. A-Ws, Mag. ZG, A10, 652/1841. 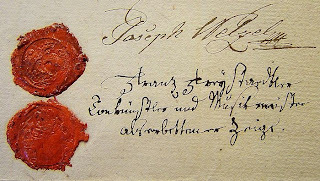 Freystädtler's latest known signature, dating from 5 October 1831, in the will of the tailor Joseph Welzel who in 1835 committed suicide. Welzel was the boyfriend of Magdalena Hauser (1788-1837), the sister of Anna Königshuber (1785-1843), who was the mother of Freystädtler's son Sigmund Franz. A-Wsa, Mag. ZG, A10, 134/1835. 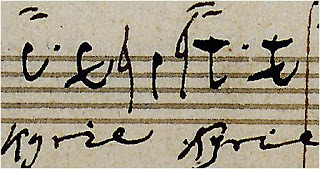 Freystädtler’s musical handwriting is orderly and well organized. To cut the matter short: it is highly professional. Freystädtler, Lamentationes Jeremiae, Lectio I. F-Pn, Coll. Malherbe, Ms. 1866. 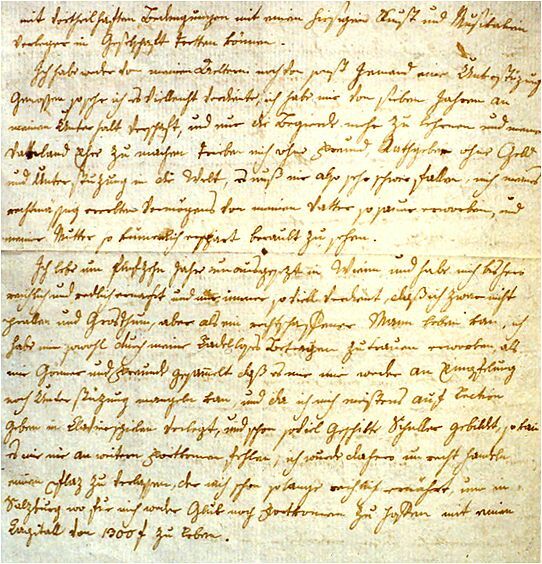 Freystädtler's handwriting. PL-Kj, Mus. ms. autogr. Mozart 516, fol. 9r. 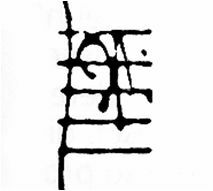 Freystädtler‘s handwriting, PL Kj, Mus. ms. autogr. 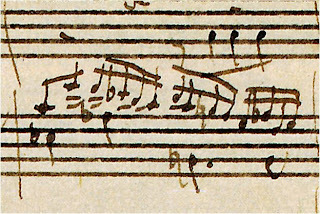 Mozart 516, fol. 9r. 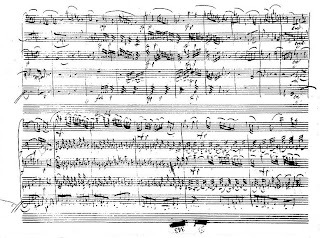 Freystädtler's arrangement of K. 590 (1792), end of the 1st movement. A-Wgm, Ms Freystädtler. Anonymous hand. A-Wn, Mus. Hs. 17561a, K. 626, Kyrie, fol. 6v, bars 15-16. These two examples were definitely not written by the same person. 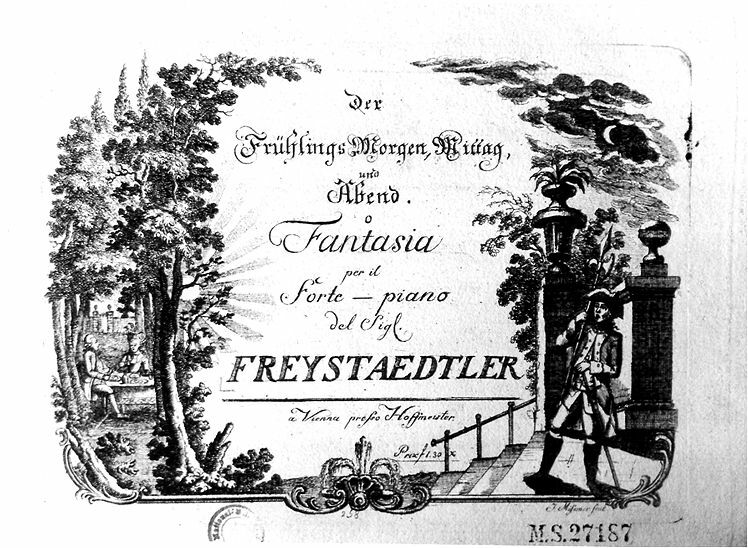 After a struggle of more than two years with the Salzburg municipal court and his mother (who, by the way, proved to be the more difficult obstacle to overcome than the authorities), in 1789 Freystädtler finally received a share of his inheritance and immediately began publishing various piano pieces. Freystädtler's Der Frühlings Morgen, Mittag und Abend, Fantasia per il Forte-piano (1790). A-Wn, M.S. 27187. There is no evidence that in 1791 Freystädtler still had any personal contact with Mozart. Because up to this time he had only published chamber music and lacked all expertise as composer of church music, it is in my opinion very unlikely that Constanze regarded him as one of the prime candidates for completing the Requiem. 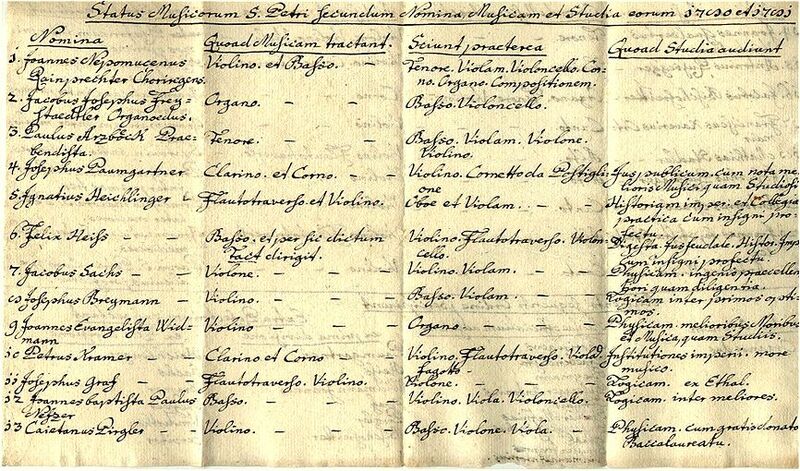 When Walther Brauneis (with the help of Waldemar Posch) found archival documents proving that the purported obsequies for Mozart had indeed taken place at St. Michael's, the whole assessment of the problem of the Kyrie instrumentation experienced a fundamental change. Suddenly there was a good reason for this obviously hurried instrumentation which had been undertaken before Eybler could begin with his completion. The Introït had to be ready for performance on December 10th, 1791. 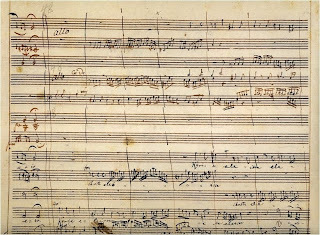 If Schikaneder had indeed organized instrumental accompaniment for the Requiem performance, the most important task before this date would have been the copying of orchestral parts for the Introït from the manuscript. In this case it would have required a reasonably skilled musician to complete the Kyrie fugue to round off the opening section. I think that is exactly what happened. In the orchestra parts of the Kyrie we see the hurried work of a musician, who – contrary to Süßmayr – at least knew the exact upper limit of the basset-horn range. 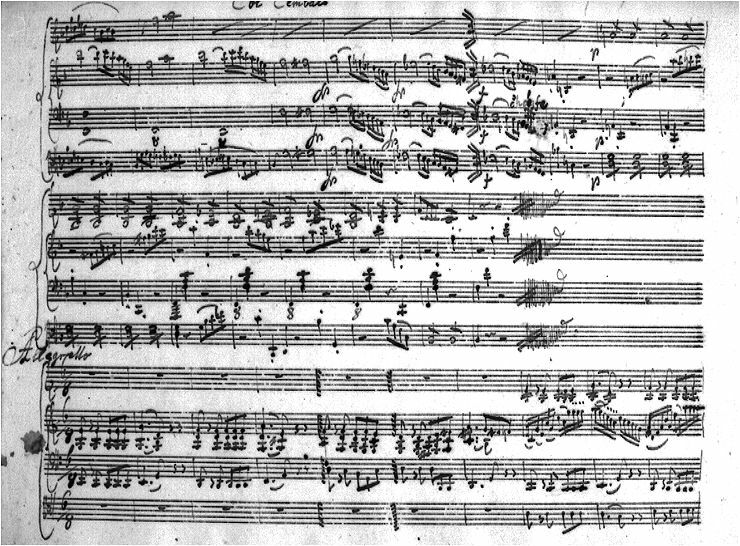 Regarding the mistakes in the transposition I tend to concur with Richard Maunder's opinion: "It should be remembered, that eighteenth-century musicians were familiar with a wide variety of C-clefs, and so when writing out a part for basset-horn in F they would probably have mentally substituted the mezzo-soprano for the treble clef, rather than literally have calculated a transposition of a fifth. In the mezzo-soprano clef the top line represents middle b', not high f'', so it would make sense to use naturals and flats instead of sharps and naturals respectively." 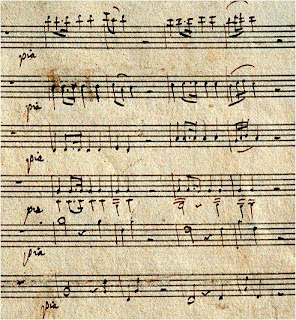 Although Mozart (except for the second half of the bass figuring) had fully written out the chorus parts of the Kyrie fugue, and these were complete in themselves, it is not possible to directly transfer the vocal music straight to the instruments without modifications (although the Kyrie might have been performed with organ and continuo only). The anonymous scribe might also have been a member of Schikaneder's troupe which was involved in arranging the exequies at St. Michael's. Schack and Henneberg can be ruled out and unfortunately we have no sample of Gerl's musical handwriting. It is very likely that we will never know what happened shortly after Mozart's death, or what was performed that Saturday at the memorial service at St. Michael's. Leopold Nowak also came to the conclusion that the trumpet and tympani parts in the Kyrie fugue were written by Süßmayr. The basis of this identification is even shakier than the arguments Nowak used for proving Freystädtler's involvement. But I will not address this particular problem, because it is not the topic of my paper. 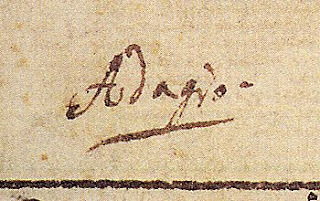 Now if somebody asked me: “Aren't there any more important issues than the question of who left traces in the autograph of the Requiem?”, I would answer: "Of course there are!" 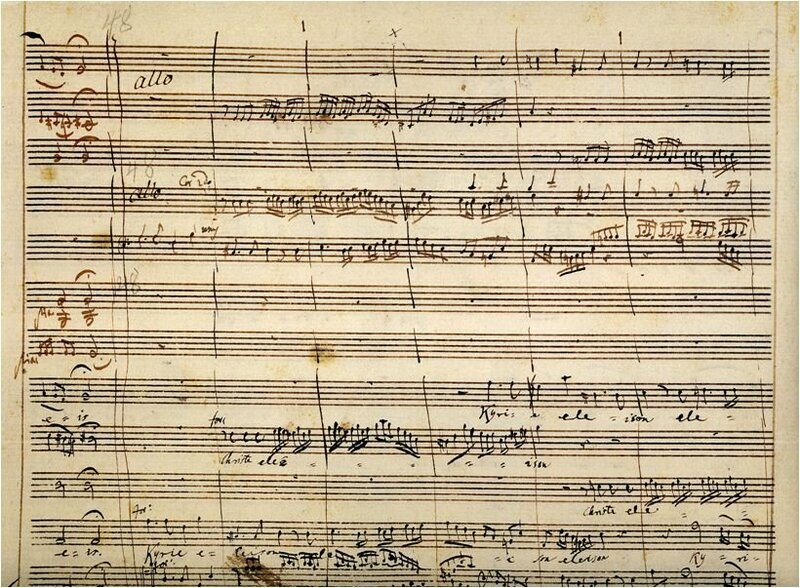 In my opinion the real problem and most important task for future research on Mozart's last work is to pose the one simple question: for whom did Mozart really write the Requiem? Of course in the long run the piece ended up to be commissioned and paid for by Count Walsegg. But I do not think that Mozart began the Requiem with Walsegg's limited instrumental forces in mind. He knew very well that the Count did not have basset horns and solo trombones at its disposal. But as I said, this is a topic for future research. "In my opinion the real problem and most important task for future research on Mozart's last work is to pose the one simple question: for whom did Mozart really write the Requiem? Of course in the long run the piece ended up to be commissioned and paid for by Count Walsegg. But I do not think that Mozart began the Requiem with Walsegg's limited instrumental forces in mind. He knew very well that the Count did not have basset horns and solo trombones at his disposal. But as I said, this is a topic for future research." Are you currently researching it? If so, the paper will, without any doubt, be utterly fascinating. Thank you again for a masterful piece of research. Simply brilliant, as usual. Thanks for your research. Best regards, José Miguel Vinuesa. Is it possible that the person who wrote it was the man who conducted for the memorial service? It is possible, but speculations are moot.